A Confederate commerce raider built secretly in Britain in 1862, the CSS Alabama destroyed more than sixty Union naval and merchant vessels on the high seas until it was sunk in a confrontation with the USS Kearsarge at Cherbourg, France on June 19, 1864. Born in Ireland and trained in London, Antisell came to the U.S. in 1848. In 1856 he became chief examiner in the chemical department of the patent office. During the Civil War he was medical director of the 12th Army Corps, surgeon in charge of Harewood Hospital, and the surgeon in charge of sick and wounded officers in Washington. A large Civil War hospital in Washington located near 7th Street and Independence Avenue, SW on the National Mall, where the Smithsonian's National Air and Space Museum stands today. Constructed in 1862, the complex included more than a dozen pavilions and overflow tents that spread beside the D.C. Armory building. Wounded soldiers from the Virginia battles were brought to the nearby wharves in southwest Washington and taken to the Armory Square Hospital. After the war, the Armory Building was used as storage facility, and it later housed the Bureau of Fisheries before being demolished in 1964. A New York attorney, Bartlett enlisted in the Army of the Potomac in May 1861 and rose through the ranks to lead a brigade in General Griffin's division of the 5th Corps, which was active in the Overland Campaign and the Siege of Petersburg. Enlisted at age 28 on May 27, 1861 at New York City as a private in Co. C, 83rd New York Infantry. Was wounded at the Battle of Antietam on September 17, 1862 and discharged due to wounds on January 26, 1863 at Philadelphia. A famous American actor and member of a renowned theatrical family, Booth, who was named after Edwin Forrest, toured America and the major capitals of Europe, often performing Shakespearean roles. His younger brother, also an actor, was John Wilkes Booth, who assassinated President Abraham Lincoln in April 1865. Captain Hill saw Edwin Booth perform as Richelieu and Shakespeare’s Richard III in Washington. An American actress, she made her debut in 1846 and married D.P. Bowers the next year. The couple moved to Philadelphia where they became principals of the Walnut Street Theatre Company. After her husband's death in 1857, Bowers played in New York and on tour, then spent several seasons in England. Captain Hill saw her perform two hit plays based on Victorian novels, Lady Audley’s Secret and East Lynne. A West Point graduate who became an arms manufacturer and railroad executive before being offered a brigade command early in the Civil War. When General McClellan was relieved following the Battle of Antietam, Burnside assumed command of the Army of the Potomac until the disastrous Union defeat at Fredericksburg in December 1862. Returned to his old command of the 9th Corps, Burnside led his troops in the major battles of the Overland Campaign. He was relieved after his troops were routed at the Battle of the Crater at Petersburg in July 1864. Burnside’s unusual style of facial hair is now known as sideburns, derived from his last name. Enlisted at age 23 on March 1, 1862 at Detroit as Private in Co. K, 16th Michigan Infantry. 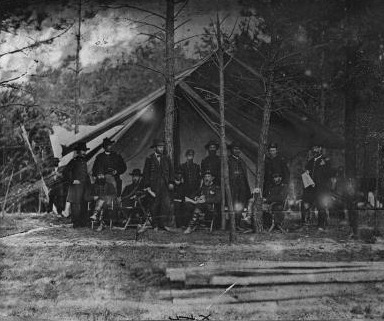 At Laurel Hill, Virginia, on May 8, 1864 he was severely wounded in the right leg, which was amputated. He was discharged due to wounds on December 9, 1864 at Washington, D.C.
Born in Michigan as the daughter of a wealthy judge, "Libby" Bacon met the flamboyant Union soldier George Armstrong Custer in 1862 and they were married when her father finally assented in February 1864. She became an active defender of her husband’s reputation after he was killed at the Battle of Little Big Horn in 1876. As the wife of a Union general and daughter of a prominent Michigan official, Mrs. Custer made a point of visiting wounded Michigan soldiers in Washington during the Civil War. Enlisted in the 16th Michigan Infantry, Co. K at Detroit on March 1, 1862, age 27. Promoted from private to corporal during the war, he was wounded at the Po River, Virginia, on May 10, 1864 but served to the end of the war, when he was discharged on July 8, 1865. A popular play based on a sensational English bestselling novel of the same title by Ellen Wood (1861). In the play, Lady Isabel Carlyle disguises herself as Madam Isabel Vane and takes the position of governess in the household of her former husband and his new wife. On January 18, 1862 at age 17 he enlisted as a private and was enrolled in Co. G, 16th Michigan Infantry. Was wounded on May 26, 1864 near Hanover Junction, Virginia but served out the war, having been promoted to Sergeant. Enlisted at age 21 on July 21, 1861 as a second Lieutenant and commissioned into Co. G, 16th Michigan Infantry on September 16, 1861. Wounded on June 27, 1862 at Gaines’ Mill, Virginia, he was promoted to Lieutenant Colonel on July 29, 1864 and commissioned as a staff officer of the 29th Michigan Infantry. Served through the war and was mustered out on September 6, 1865. Enlisted at Detroit on August 13, 1861, he served as a captain of Co. E, 16th Michigan Infantry and was wounded on August 30, 1862 at the Second Battle of Bull Run. Promoted to major in the 16th Michigan on June 20, 1863, he was killed on May 30, 1864 at Totopotomoy Creek, Virginia. James T. Ford, manager of the Atheneum Theater on Tenth Street in Washington, raised enough money when that house burned down to erect a "magnificent new Thespian temple" on the same site. Opened in August 1863, Ford’s Theater boasted seating for 2,400, a portrait of Shakespeare on its fine drop curtain, and carpeted private boxes. It attracted famous actors as well as President Lincoln, who returned often after his first visit in October 1863. Lincoln was assassinated there by John Wilkes Booth in April 1865. A celebrated American actor who left the stage in 1853 but returned just before the Civil War to play some of his most famous roles, including Edward Bulwer-Lytton’s Richelieu (1839) and Damon in Jean Banim’s Damon and Pythias (1821). Enrolled at age 33 on July 28, 1863 as Second Lieutenant in 70th New York Infantry. Was wounded at Gettysburg on July 2, 1863 and promoted to First Lieutenant on July 15, 1863. Discharged on May 11, 1864. Enlisted September 26, 1862, he served as a private in 40th New York infantry and later was promoted to Corporal. Was wounded at Petersburg on March 25, 1865 and discharged due to disability on August 1, 1865. A career army officer, Griffin fought in the Mexican War and rose to command a division of the 5th Corps of the Army of the Potomac during the Virginia campaign of 1864. Enrolled at age 30 on January 19, 1864 at Detroit as a private in Co. K, 16th Michigan Infantry. He was wounded on May 7, 1864 at the Battle of the Wilderness and killed on September 30, 1864 at Poplar Grove Church during the siege of Petersburg, Virginia. A 19-year old Michigan native, Jacklin joined the company of Brady’s Sharpshooters, which was attached to the 16th Michigan Infantry, in October 1861. He rose through the ranks to lieutenant, then acting adjutant of the 16th in November 1862. Jacklin was taken prisoner by Confederate troops during a night skirmish on May 8, 1864, but was rescued the following day by Union cavalry. In July 1864 he was promoted to major commanding his own battalion of sharpshooters. Jacklin served to the end of the war and was present when Lee’s army surrendered at Appomattox Courthouse. Part of the Gettysburg campaign, the Battle of Middleburg, Virginia took place on June 17-19, 1863 when Union forces collided with Confederate General J.E.B. Stuart’s troops, who were screening General Robert E. Lee’s invasion of the North. In this inconclusive engagement, Stuart was forced to shift position but retained control over high ground that prevented Union forces from crossing the Blue Ridge gap. Enrolled on July 30, 1861 at Flint, Michigan at age 32, he was commissioned as a First Lieutenant in the 16th Michigan Infantry. He was promoted to Quartermaster on August 9, 1861 and then Acting Brigade Quartermaster of the 3rd Brigade, 1st Division, 5th Army Corps on December 1, 1862. Discharged on September 7, 1864. Enlisted on October 12, 1861 at Bay City, Michigan as Second Lieutenant, and was assigned to H Company, Lancers (Michigan), then later the 16th Michigan Infantry. Was wounded several times, including at Malvern Hill in July 1862, Gettysburg on July 2, 1863, and three times during the struggle between Grant and Lee’s armies in Virginia. Served as Captain in the 16th Michigan during the Wilderness campaign and was promoted to Lt. Colonel by the end of the war. Was mustered out on July 1, 1865. Enrolled at 21 years of age on March 1, 1862 at Detroit, he was placed in Co. K, 16th Michigan Infantry as a private. He was wounded on May 7, 1864 at the Battle of the Wilderness, Virginia, and discharged due to wounds on March 21, 1865. Joined the Union Army at age 35 on July 14, 1863 at Parrishville, New York, as a private in Co. G, 83rd New York Infantry. He was transferred to the 97th New York Infantry on June 7, 1864. A New Yorker who graduated from West Point in 1845, Russell served in the Mexican War and at the Pacific Northwest before returning east during the Civil War. Russell fought in the Peninsular campaign and at the Battle of Antietam before being promoted to brigadier general of volunteers. He led a division in General Horatio Wright’s 6th Corps during Grant’s Overland Campaign and was mortally wounded later in 1864 in the Shenandoah Valley during the Battle of Opequon. Enlisted at Detroit, Michigan on April 5, 1862 at age 23 as a private in the 16th Michigan Infantry, Co. K. Was wounded on August 30, 1862 at the Second Battle of Bull Run, taken prisoner, and paroled. Later that year he was discharged due to disability, but apparently re-enlisted. Enlisted at age 20 on January 18, 1864 at Detroit as a private in Co. K, 16th Michigan Infantry. He was severely wounded in the right leg on May 8, 1864 at Laurel Hill, Virginia and discharged due to wounds on February 20, 1865. A West Point engineer and career army officer, Warren distinguished himself in the Peninsular Campaign and at the Battle of Gettysburg. Warren led the Army of the Potomac’s 5th Corps through the Overland Campaign and the Siege of Petersburg before being relieved by General Sheridan at the Battle of Five Forks in April 1865. Enlisted at age 26 on August 22, 1861 at Detroit, Michigan, he was commissioned into the Field and Staff of the 16th Michigan Infantry, where he was promoted to Lieut. Colonel and then Colonel. Welch may have fled to the rear during the fight at Little Round Top on the second day at Gettysburg. He redeemed himself by being killed while bravely leading his men over Confederate earthworks at the Battle of Poplar Grove Church, Virginia, on September 30, 1864. Enlisted at Argentine, Michigan on August 23, 1862, this young man of 18 was enrolled as a private in Co. K of the 16th Michigan Infantry and joined the regiment shortly after the Battle of Antietam. He was wounded on May 10, 1864 at the Po River in Virginia, but served until April 30, 1865, when he was discharged. White House Landing on the Pamunkey River in Virginia, named after a nearby plantation, was the site of a major Union Army supply base during the Peninsula Campaign of 1862 and again during Grant’s Overland Campaign of 1864. Enlisted at age 27 on March 1, 1862 at Detroit as a private in Co. K, 16th Michigan Infantry. He was wounded on May 7, 1864 at the Battle of the Wilderness in Virginia but served out the war, finally being discharged on July 24, 1865. Born in Detroit, he graduated from West Point in 1847 and served in the Mexican War and Third Seminole War before resigning to civilian life in 1857. Wilcox returned to service at the outset of the Civil War and was wounded and captured at the Battle of Bull Run. By 1864 he had risen to brigadier general and led a division of General Burnside’s corps during Grant’s overland campaign. Enrolled on August 24, 1861 as a private in Co. G, 16th Michigan Infantry, he served to the end of the war and was mustered out on July 8, 1865.